The presynaptic protein α-synuclein is involved in a range of neurodegenerative diseases. Here we analyze potential compensatory mechanisms in α-synuclein null mutant mice. Furthermore, the findings reveal problems that may be associated with inbred mouse strains. Expression profiling by cDNA array technology in a transgenic mouse model revealed striking differences only in the expression level of α-synuclein. This was caused by a chromosomal deletion of the α-synuclein locus in the C57BL/6J inbred strain used for backcrossing. However, the deletion is only present in a subpopulation of C57BL/6J mice, namely animals from Harlan. No other genes are known to be affected by the deletion, which is estimated to be smaller than 2 cM. We propose to name this strain C57BL/6S. C57BL/6S animals appear phenotypically normal. They show no upregulation of β-synuclein or γ-synuclein, excluding a compensatory mechanism. Also, the expression of synphilin-1 was unaffected. The C57BL/6S strain should help in the understanding of the physiological function of α-synuclein and its involvement in synucleinopathies. Also, the findings exemplify unexpected complications that may arise during the study of transgenic models or inbred strains, in particular when combined with genome wide screening techniques. The linkage of two missense mutations in the human α-synuclein gene to rare inherited forms of Parkinson's disease (PD) [1, 2] has implied that the protein plays a part in neurodegenerative diseases. Subsequently, α-synuclein was shown to be the major component of Lewy bodies (LB) in PD [3, 4] as well as in a range of other neurodegenerative diseases, classified as synucleinopathies [for review see ]. During development, mice express increasing levels of α-synuclein mRNA, peaking at postnatal day seven (P7) [6, 7]. The α-synuclein protein is mainly expressed in neurons and located in the presynaptic termini [8, 9]. So far, a number of animal models have been developed for the study of α-synuclein. Overexpression of wildtype or mutant α-synucleins in mice [10, 11] or Drosophila resulted in pathological and behavioral phenotypes similar to those found in PD. Homozygous α-synuclein knockout mice are viable, fertile, and have apparently normal brain morphology. Hippocampal synaptic plasticity in these mice was identical to wildtype animals as judged by LTP measurements. However, an alteration of dopamine release in the nigrostriatal system was observed . The primary protein sequence of β-synuclein [14, 15] shows a high degree of identity to α-synuclein (particularly in the N-terminal region), with both sharing similar expression patterns and subcellular localization [15, 16]. Thus, it can be speculated that the two proteins may have similar physiological functions. γ-synuclein , the third member of the synuclein family is mainly expressed in the peripheral nervous system throughout development and, at lower levels, in brain . β- and γ-synuclein have also been implicated in axonal pathological processes . Yeast-two-hybrid analysis with human DNA fragments has identified synphilin-1 as a specific interaction partner of α-synuclein . Little is known about its function, however, it was shown to be present in most Lewy bodies in PD (but absent from α-synuclein positive Lewy neurites) . Wide scale mRNA expression profiling by cDNA array technology on a transgenic mouse model led us to the discovery of a C57BL/6J substrain with a chromosomal deletion spanning the α-synuclein gene locus (Snca). Subsequently, we analyzed the consequences of the absence of α-synuclein on the expression levels of β- and γ-synuclein and synphilin-1. The analysis of brain mRNA expression profiles by cDNA array technology demonstrated striking differences in the expression levels of α-synuclein in an engineered mouse model (Kneussel, Annala, Schoepfer; in preparation), with arbitrary expression units of 3495 (wildtype) and 457 (transgenic). All other analyzed genes were not significantly altered in their expression (less than factor 2x; Fig. 1A). The transgenic animals used in this study had been backcrossed into the BL6JHUK strain (see methods). Since further investigation on the transgenic model led to contradictory results (data not shown), mRNA expression levels were compared between different wildtype strains used in the generation of the transgenic mice. α-synuclein expression levels. A. cDNA array experiment using brain polyA+-RNA from a transgenic mouse and a wildtype littermate at the developmental time point E18.5. From all analyzed genes (approximately 9000 ESTs), only the expression of α-synuclein (GenBank W41663) was significantly altered (indicated by an arrow; differential expression factor 7.6x). The data are represented without background substraction. Expression is quantified as units of fluorescence intensity. Diagonals indicate differential expression by 2x and 10x, respectively.B. Northern blot of brain polyA+-RNA (500 ng per lane) from 129/Ola, ICR, and BL6JHUK mice at the developmental time points P0, P8, P15, and adult, probed with an α-synuclein 3'UTR probe. The α-synuclein transcript size is approximately 1.5 kB. RNA samples were pooled from 4 animals (at P0), or from 2 animals (at P8 and P15) from the same litter. After stripping the membrane was re-probed with an actin probe. C.Brain homogenate from 129/Ola, ICR, and BL6JHUK mice at P0, P8, P15, and adult age was separated by 15% SDS-PAGE (20 μg protein per lane). The Western blot membrane was simultaneously probed with the monoclonal anti α-synuclein and anti α-tubulin antibodies. Recognized protein bands have apparent molecular weights of approximately 19 kDa and 55 kDa, respectively. Expression of α-synuclein in brains of 129/Ola, ICR, and BL6JHUK mice was compared by Northern blot analysis. A clear difference between the strains was observed at any considered developmental time point. No signal could be detected in BL6JHUK mice, whereas the other strains expressed equal amounts of the α-synuclein transcript (Fig. 1B). Between P0 and P15 mRNA expression increased in 129/Ola and ICR mice as previously described [6, 7]. Expression of α-synuclein mRNA was observed as early as on embryonic day 14 (E14; on total embryo RNA) and E17 (brain RNA) in ICR but not in BL6JHUK mice (data not shown). Consistent with this result, no detectable expression of α-synuclein protein was observed in BL6JHUK in contrast to the 129/Ola and ICR strains (Fig. 1C). In agreement with previous studies protein levels increased during postnatal development , but were consistently absent from the BL6JHUK strain. At prenatal stages (using homogenates from embryo at E14 and brain at E17), α-synuclein expression was below detection levels in ICR and BL6JHUK animals (data not shown). Although α-synuclein expression was not observed in the BL6JHUK strain the detection of low expression levels could require methods of greater sensitivity. Therefore, mRNA expression of α-synuclein was determined by semi-quantitative RT-PCR analysis (Fig. 2A). Amplification on brain total RNA of an ICR mouse at P15 with specific α-synuclein primers resulted in a detectable cDNA fragment after as few as 20 PCR cycles. However no product was detected using BL6JHUK RNA, even after 35 cycles of amplification. When BL6JHUK RNA was contaminated with low levels of ICR RNA the appearance of the α-synuclein PCR product could be observed even at a dilution factor of 104 after 35 cycles. This indicates that expression of α-synuclein mRNA in BL6JHUK is decreased by at least this factor compared to the ICR strain. Identical results were obtained with P8 and E14 samples (data not shown). Therefore, the α-synuclein gene locus (Snca) in the BL6JHUK strain must be considered a null allele. Deletion of the α-synuclein gene locus in the BL6JHUK strain. A. Semi-quantitative analysis of α-synuclein expression in BL6JHUK mice by RT-PCR, sized on a 1.5% agarose gel. A 568 bp α-synuclein band is detected after as few as 20 PCR cycles on brain total RNA of an ICR mouse at P15. No signal was detected in the BL6JHUK sample even after 35 cycles. However, when the BL6JHUK sample was contaminated with as little as 0.01% ICR RNA, the α-synuclein band could still be detected after 35 PCR cycles. The control shows amplification of a 473 bp tubulin fragment with constant 35 cycles. B. Probing for the presence of the α-synuclein gene in the ICR, 129/Ola, BL6JHUK, BL6N, BL6, and BL6Jax strains. Genomic α-synuclein DNA fragments of exon 4 and of exon 6 were amplified by PCR and the products separated on a 2% agarose gel. In a control experiment, a fragment of the NR1 gene was amplified. Fragment sizes are 130 bp, 266 bp, and 508 bp, respectively. C. Genomic PCR on BL6JHUK and BL6Jax DNA with the markers Atoh2, D6Mit122, D6Mit357, Atoh1, and D6Mit299. The D6Mit357 signal was absent from the BL6JHUK strain, whereas all other markers amplified on the two DNA samples. Atoh2 and D6Mit122 are both currently mapped to about 1 cM upstream of Snca (marker D6Mit357), Atoh1 and D6Mit299 both to about 1 cM downstream of this locus [; and databases cited there]. PCR products were separated on a 2% agarose gel. To further elucidate the mechanism underlying this phenomenon, the presence of the Snca locus was analyzed. Genomic PCR experiments revealed the absence of the α-synuclein locus in BL6JHUK mice (Fig. 2B). In contrast to the ICR and 129/Ola strains, amplification of genomic DNA fragments corresponding to exon 4 and exon 6 of the α-synuclein gene yielded no PCR product in the BL6JHUK sample. PCR amplification spanning intronic α-synuclein sequences (exons 1 to 2, exons 5 to 6) yielded identical results (data not shown). Reproducibility was confirmed on a number of BL6JHUK mice (n = 8) from four batches of animals. Sequence alignment with the mouse α-synuclein chromosomal sequence (GenBank AF163865; ) locates the chromosome 6 genomic marker D6Mit357 to the sequence between exons 4 and 5 (data not shown). Again, this primer pair did not yield an amplification product on BL6JHUK DNA, whereas loci in close proximity to Snca were not deleted (Fig. 2C). 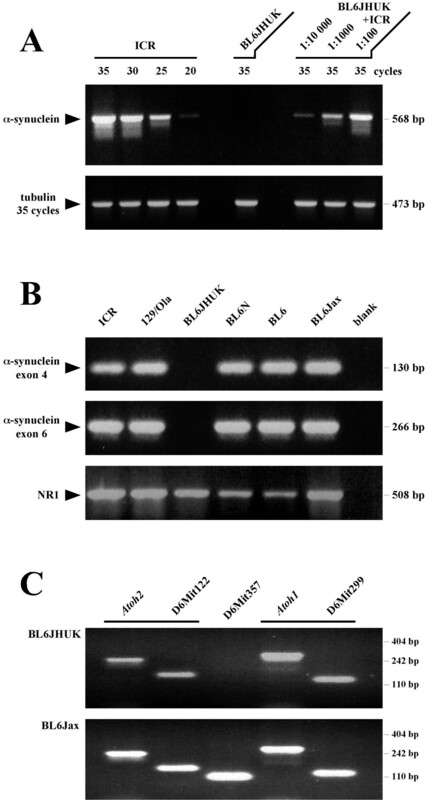 Further analysis of mouse strains related to BL6JHUK (BL6N and BL6) revealed that both did not contain the deletion (Fig. 2B). Western blotting confirmed α-synuclein protein expression in adult BL6N and BL6 animals (data not shown). To establish whether the entire C57BL/6J strain was affected by the deletion, C57BL/6J DNA samples from two different sources were compared. It appeared that BL6Jax DNA (C57BL/6J provided by Jackson Laboratory, Bar Harbor, ME) was not affected by the deletion. This is in contrast to BL6JHUK DNA (C57BL/6J from Harlan, Bicester, UK) (Figs. 2B and 2C). Therefore only a subpopulation of the C57BL/6J mice carries the deletion of the Snca locus and thus we suggest that this new strain should be called 'C57BL/6S'. Since α-synuclein null mice do not display any striking phenotype (our observation; ) expression of β-synuclein was analyzed for possible compensatory mechanisms. Western blot analysis revealed that protein levels of β-synuclein remain unaffected by the α-synuclein deletion at any stage of postnatal development (Fig. 3A). Expression of the 19 kDa protein was uniform in the 129/Ola, ICR, and the BL6JHUK strain and increased noticeably during postnatal development. Developmental expression of β- and γ-synuclein in different mouse strains. A. 15% SDS-PAGE was performed on brain homogenate from the 129/Ola, ICR, and the BL6JHUK strain at time points P0, P8, P15, and adult (20 μg protein per lane). The Western blot membrane was probed with polyclonal anti β-synuclein IgG, detecting the 19 kDa protein. The lower part shows the anti α-tubulin control. B. Northern blot of brain polyA+-RNA (500 ng per lane) from 129/Ola, ICR, and BL6JHUK mice at different developmental stages (P0, P8, P15, and adult). Probing with a 3'UTR γ-synuclein probe detects a transcript of approximately 0.8 kB. RNA samples were pooled from 4 animals (at P0), or from 2 animals (at P8 and P15) from one litter (same membrane as in Fig. 1B, actin control identical to Fig. 1B). Furthermore, Northern blot analysis indicated that the expression of γ-synuclein was not significantly altered by the absence of α-synuclein in BL6JHUK mice during postnatal development (Fig. 3B). This had been already indicated by the array analysis (Fig. 1A). The γ-synuclein signal (arbitrary expression units) was 2325 (wildtype) vs. 2492 (transgenic animal with Snca deletion). Human α-synuclein had been shown to specifically interact with human synphilin-1 protein . Therefore, the influence of the α-synuclein deletion on expression levels of synphilin-1 in mice was tested. Synphilin-1 expression was found to be unaffected by the absence of α-synuclein in the knockout strain BL6JHUK. Equal levels of synphilin-1 transcript were detected in the 129/Ola, ICR, and BL6JHUK strains by Northern blotting (Fig. 4A). Likewise, protein expression levels were unaltered between the strains, as judged by Western blot analysis, and showed a slight increase during postnatal development (Fig. 4B). 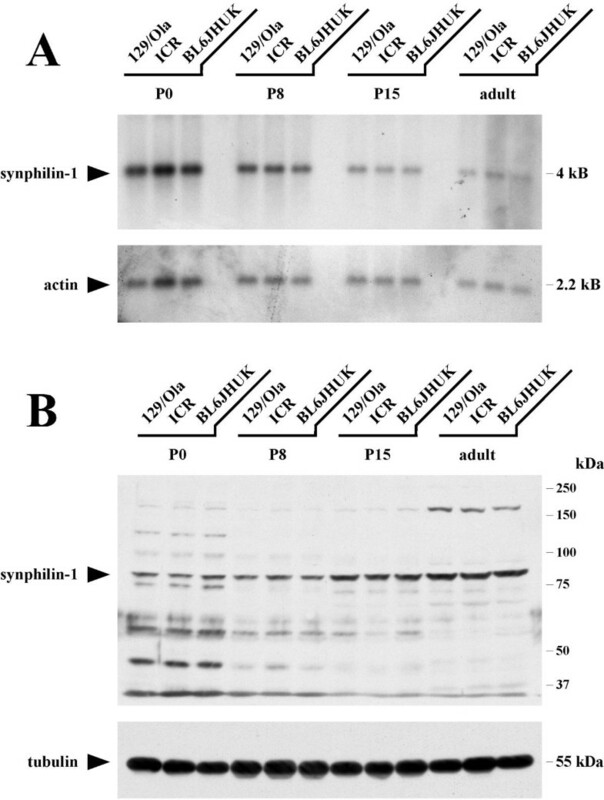 Developmental expression of synphilin-1 in different mouse strains. A. Northern blot of brain polyA+-RNA (500 ng per lane) from 129/Ola, ICR, and BL6JHUK mice at different developmental stages (P0, P8, P15, and adult). Probing with a 1.5 kB synphilin-1 probe detects a transcript of approximately 4 kB. RNA samples were pooled from 4 animals (at P0), or from 2 animals (at P8 and P15) from one litter. After stripping, the membrane was re-probed with an actin probe. B. Brain homogenate from 129/Ola, ICR, and BL6JHUK mice at P0, P8, P15, and adult age separated by 7.5% SDS-PAGE (30 μg protein per lane). 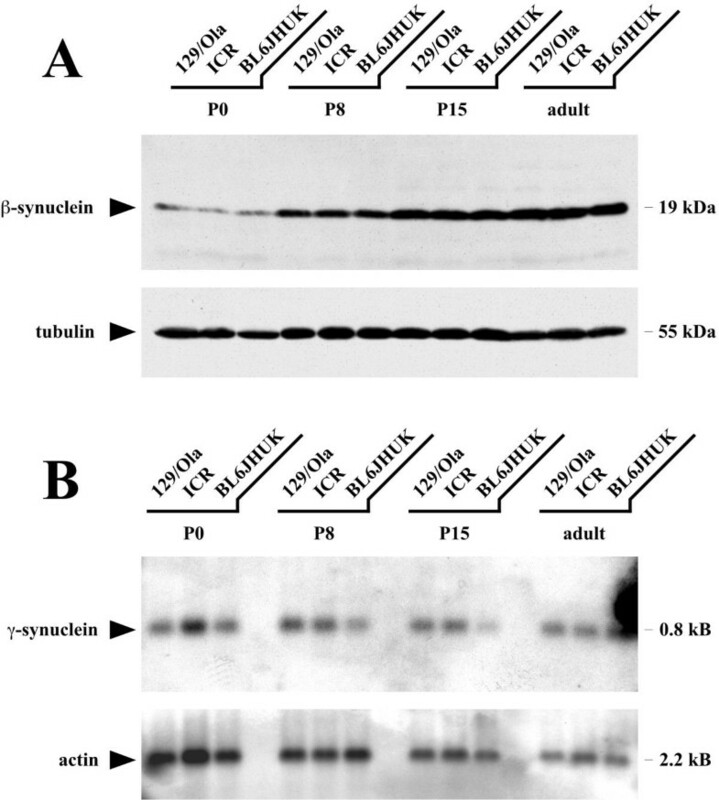 The Western blot membrane was sequentially probed with polyclonal anti synphilin-1 and monoclonal anti α-tubulin antibodies. The recognized proteins have apparent molecular weights of approximately 85 kDa and 55 kDa, respectively. The results unequivocally show that a subpopulation of C57BL/6J mice carry a chromosomal deletion of the α-synuclein gene locus (Snca). This deletion is responsible for the absence of α-synuclein mRNA and protein expression in affected animals. Within this paper, the substrain has been referred to as BL6JHUK according to its source (see methods). We now propose to name this new strain C57BL/6S (S for α-synuclein). The discovery of a chromosomal deletion of α-synuclein in C57BL/6J DNA was unexpected since, for example, the protein had been previously detected in brain from wildtype C57BL/6 mice . Furthermore, α-synuclein cDNA clones have been isolated from C57BL/6J libraries (GenBank W41663 and AA266446), implying the presence of the α-synuclein gene. Indeed, the deletion of α-synuclein was shown to only affect a subpopulation of C57BL/6J animals and did not occur in the related strains C57BL/6N and C57BL/6. It remains to be established how widespread this deletion is within different C57BL/6J colonies. The deletion was not present in the C57BL/6J DNA provided by the Jackson Laboratory (Bar Harbor, ME), in contrast to C57BL/6J from Harlan (Bicester, UK). All animals from this source that were analyzed during the year 2000 were shown to carry the mutation (n = 8 from four batches of animals), suggesting that a majority of the colony is affected. However, it cannot be excluded, that the colony is heterogeneous for the deletion. From the information available to us, it seems likely that the mutation has been present in the colony as early as 1998. Further investigation will be needed to determine the prevalence of the deletion within the mouse colony and the time point at which it occurred. The chromosomal deletion was shown to cover the complete Snca locus. Exon 1 and exon 6 of the gene are 97 kB apart (GenBank AF163865; mouse strain 129/SvJ; ) and flank the chromosome 6 marker D6Mit357. However, the deletion was shown not to include loci currently mapped at a distance of only 1 cM to each side of Snca, namely Atoh1 and Atoh2. At present, no other genes are known to be located between Atoh1 and Atoh2. In the future, large scale screening of expression profiles [for example ] by cDNA array technology or proteomics is likely to identify unexpected genomic variants. It will be interesting to see how frequently such deletions occur and whether they play an important role in evolution. For the moment, the occurrence of such deletions has implications on the number of genetic markers needed to validate mouse strains. C57BL/6S mice are fertile, appear to be healthy, and have normal life expectancies, in agreement with the data on α-synuclein knockout mice . To explain the lack of a noticeable phenotype in the absence of α-synuclein, potential compensatory mechanisms were tested. However, there was no indication of altered β- or γ-synuclein expression in the C57BL/6S strain. Likewise, the absence of α-synuclein did not alter expression levels of synphilin-1, with which it interacts specifically . Despite the absence of compensatory upregulation it is still possible that α- and β-synuclein have similar functions and this would be addressed by deleting both loci. Furthermore, it can be inferred from the initial cDNA array experiment that the deletion of Snca does not result in significant changes in the expression levels of the other genes represented on the array (Fig. 1A). These include ubiquitin C-terminal hydrolase L1 that also has been found in LB . This transcript was highly expressed with 16699 (wildtype) vs. 14393 (transgenic animal with Snca deletion) arbitrary expression units. We have discovered a chromosomal deletion in a subpopulation of the widely used inbred mouse strain C57BL/6J. Such cryptic genetic alterations in a model thought to be well defined may underlie confusing results of well executed experiments. The described strain C57BL/6S has a deletion of the α-synuclein locus and may be a valuable tool to obtain a better insight into the physiological function of α-synuclein and its role in synucleinopathies. C57BL/6J mice were obtained from Harlan (Bicester, UK; C57BL/6JOlaHsd). Mice from this source are referred to as BL6JHUK within this publication. C57BL/6 mice (Harlan, Bicester, UK) are referred to as BL6, and C57BL/6N (Charles River, Margate, UK) as BL6N. Furthermore, C57BL/6J genomic DNA was obtained from Jackson Laboratory (Bar Harbor, ME; stock JR0664, preparation P34170) and is referred to as BL6Jax. ICR and 129/Ola mice were obtained from Harlan (Bicester, UK). Tissue from adult animals (generally three months old) was isolated from mice obtained through their respective suppliers. Samples at developmental stages up to three weeks originate from animals bred at UCL for less than two generations. Unless otherwise stated, material used in the experiments was obtained from individual animals. Generally, male animals were used. Total RNA was isolated from brains (including cerebellum) using Trizol reagent (Gibco, Life Technologies, Paisley, UK). PolyA+-RNA was prepared with oligo-dT columns (Oligotex; Qiagen, Crawley, UK). The array experiment was performed by Genome Systems (now Incyte Genomics, St. Louis, MO; mouse GEM 1 microarray, cat. No. GEM-5200) on 600 ng polyA+-RNA (for further information see http://www.incyte.com/gem). For Northern blot analysis RNA was size separated by formaldehyde denaturing gel electrophoresis and transferred onto Hybond-N membranes (Amersham Pharmacia, Little Chalfont, UK). After hybridization of the random-primed 32P-probes (Prime-It-Kit; Stratagene, Amsterdam, Holland) the final stringency washes were 0.3x SSPE at 65°C. Restriction fragments of an α-synuclein cDNA clone (GenBank W41663; I.M.A.G.E. Consortium CloneID 353366; HGMP, Cambridge, UK; http://image.llnl.gov; ) were used to generate radiolabelled probes. A probe to the 3'-untranslated region (3'UTR) of α-synuclein was obtained from a 557 bp fragment (BglII/NotI). The 201 bp EcoRI/NcoI (5'UTR) and 469 bp NcoI/NcoI fragments (coding sequence) led to identical results (data not shown). A 3'UTR probe of γ-synuclein was obtained from a 394 bp restriction fragment (EcoRI/NotI) of a cDNA clone (GenBank BE133521; I.M.A.G.E. Consortium CloneID 1533487; HGMP, Cambridge, UK; http://image.llnl.gov; ). Consistent results were obtained using probes for the coding sequence or for full-length cDNA (data not shown). A probe to the synphilin-1 coding sequence was generated using a 1.5 kB RT-PCR fragment (primers CTTCTGTGGCTTCTTCAGTTTATGC and GCTGCCTTATTCTTTCCTTTGCTAGC). Same results were obtained with a slightly overlapping 290 bp synphilin-1 fragment (primers CAGTTGGAGTGCGTACGCTGGATGGT and GGCTTTTCCCCAGCGTGGTTCTGCAT; data not shown). Primers were designed using the human synphilin-1 sequence (GenBank AF076929). Sequencing revealed a high degree of identity between the human and mouse sequences (approximately 90% and 85% identity within two stretches of about 500 bp each on the cDNA level; data not shown). A murine 0.9 kB probe to the actin coding sequence served as positive control, revealing a band of about 2.2 kB in brain RNA. Total brain tissue was homogenized in boiling lysis buffer (1% SDS, 1 mM Na3VO4, 10 mM Tris, pH 7.4), microwaved for 15 seconds, and cleared by centrifugation. Samples were denatured in loading buffer containing SDS and β-mercaptoethanol, followed by SDS-PAGE, using prestained protein markers (Biorad, Hemel Hempstead, UK). Proteins were blotted onto Hybond-P membranes (Amersham Pharmacia). Membranes were blocked in buffer containing 50 mM Tris pH 8.0, 2 mM CaCl2, 80 mM NaCl, 0.2% (v/v) Igepal CA-630 (Sigma, Poole, UK) and 5% (w/v) dried skimmed milk (Marvel; Premier Brands, Wirral, UK) for one hour to overnight. Primary antibodies were applied for one hour, followed by washes with blocking buffer. Peroxidase-conjugated secondary antibodies (goat anti-rabbit or goat anti-mouse IgG; 111-035-003 and 115-035-003; Jackson ImmunoResearch Laboratories, West Grove, PA) were incubated for one hour at a dilution of 1:10000, followed by washes in blocking buffer and PBS. Membranes were developed with ECL Plus reagent (Amersham Pharmacia) and exposed on film (X-OMAT-AR; Kodak, Hemel Hempstead, UK). Membranes were stripped and re-probed according to the manufacturer's protocol. Monoclonal mouse anti rat α-synuclein IgG1 (S63320; Transduction Laboratories, Lexington, KY) was used at a concentration of 1:500. Polyclonal rabbit anti human β-synuclein IgG (1:2500; SA3405; Affiniti, Mamhead, UK) and polyclonal rabbit anti human synphilin-1 IgG (1:1000; ab6179; Abcam, Cambridge, UK) were both used in alternative blocking buffer (PBS containing 0.05% Tween20 and 3% BSA). The synphilin-1 antibody was raised against an N-terminal epitope and recognized several protein bands on Western blots. Since only one of these proteins was of the expected size (approximately 85 kDa) and expressed throughout development this was taken for the genuine target protein synphilin-1. Monoclonal mouse anti chick α-tubulin IgG1 (1:20000; T9026; Sigma) detected a 55 kDa band, which was used as positive control. Genomic DNA was isolated from tail samples using a proteinase K / SDS protocol  with the exception of BL6Jax DNA (C57BL/6J, stock JR0664, preparation P34170; Jackson Laboratory, Bar Harbor, ME). Touchdown PCR on 1 μg genomic DNA in 25 μl included denaturation at 94°C (30 sec), annealing at 68°C (30 sec with dT = -0.5°C each cycle), and extension at 72°C (45 sec) for 30 cycles, followed by further 10 cycles with constant 52°C annealing temperature. Specific primers amplified mouse α-synuclein exon 4 (AGAAGACCAAAGAGCAAGTGACA and ATCTGGTCCTTCTTGACAAAGC, 130 bp fragment) and α-synuclein exon 6 (AAGACTATGAGCCTGAAGCCTAAG and AGTGTGAAGCCACAACAATATCC, 266 bp), as well as NMDA receptor subunit NR1 (exons 18 to 19, GTCCATACTCAAGTGAGTCTGCCC and CAGGGGCATTGCTGCGGGAGTC, 508 bp) as a positive control. This was alternatively performed as an internal control (data not shown). Amplification of the chromosome 6 genomic marker D6Mit357 (UniSTS database, NCBI, http://www.ncbi.nlm.nih.gov/genome/sts) yielded a 100 bp product (primers TACAATGGCTCTCCTCCCTG and CCTCAGGATTTAAATAAATTCAAGC). The size of the deletion was estimated using a range of genetic markers close to the Snca locus. Results shown here include the following markers: mouse atonal protein homolog 1 and 2 (Atoh1, also known as MATH-1, GenBank D43694; primers CTGCAGGCGAGAGACCTTC and TCAGCTTGCACAGCTGTTC, 271 bp product; Atoh2, also known as Nex-1, GenBank U29086, TACTGCAGTGCATATGAATC and TCGTAAGGGAAGTGGCTGTC, 245 bp), and the markers D6Mit122 (GACACCCAGCATCCATCTTT and TTGTAATTTTTAAAAGATAGGTGTGTG, 139 bp) and D6Mit299 (TCATGAATATCAAAGACACACATCC and AAGCACATGCATTAGTATTTCCC, 119 bp). In these experiments genomic DNA was subjected to 30 PCR cycles (94°C/30 sec, 55°C/30 sec and 72°C/30 sec). Products were sized with MspI digested pBluescript II KS(+) (Stratagene). The reverse transcriptase reaction was performed on 50 ng total RNA in 25 μl containing 0.25 μg oligo-dT primer with Ready-To-Go RT-PCR beads (Amersham Pharmacia) at 42°C for 30 minutes, followed by PCR cycling (94°C/30 sec, 55°C/30 sec, 72°C/45 sec) with 5 pmol of each specific primer. The primers AACTGCAGTTCTTCAGAAGCCTAGGGAGC and GCTCTAGACTGGGCACATTGGAACTGAG were used to amplify a 568 bp mouse α-synuclein fragment (exons 1 to 6 on cDNA). Amplification of a 473 bp mouse tubulin α1 (Tuba1) fragment (ACACCTTCTTCAGTGAGACAGG and CTCATTGTCTACCATGAAGGCAC) served as a positive control. This work was funded by a Wellcome Trust Senior Fellowship to RS. We would like to thank Marco Peters for initial characterization of the α-synuclein locus, Steve Davies and Rushee Singh Jolly for helpful discussion and unpublished data, Philip Chen for comments on the manuscript, and Michel Goedert for the supply of antibodies.